Vancouver, Canada - Mawson Resources Limited ("Mawson") or (the "Company") (TSX:MAW) (Frankfurt:MXR) (PINKSHEETS: MWSNF) provides a summary of the Company’s successful winter drilling program at the 100% owned Rajapalot Project in Northern Finland.In total, 55 diamond drill holes for 11,056 metres and 1,801 base-of-till ("BOT") drill holes were completed, greatly expanding the Company’s knowledge of the region. 105 km of infill and extension ground magnetics collected on lines spaced at 50 metres. Exceptional rate of drill success with 42% of holes (58 out of the total 137 holes drilled in the Rajapalot project) hitting geochemically significant gold (greater than 1g/t-m). Furthermore, 28% of drill holes (39 out of a total of 137) have recorded greater than 5 g/t-m intersections. The total average drill depth on the project remains shallow at 109 metres. PAL0075: 27.0 metres @ 3.3 g/t gold (no lower cut) from 64.0 metres, including 3.0 metres @ 2.9 g/t gold from 64 metres, 2.0 metres @ 5.6 g/t gold from 70.0 metres and 8.8 metres @ 7.5 g/t gold from 82.2 metres at the Raja prospect, 1.75km from Palokas. Planning is now underway for a significant winter drill program commencing late 2017 or early 2018 dependent on winter conditions. Mr. Hudson, Chairman and CEO, states, "The winter drill program confirmed the presence of a large, gold-mineralized hydrothermal system at Rompas-Rajapalot, delivering one of Finland’s most significant gold discoveries. The high hit rate of gold over regional-scale areas, the discovery of multiple high grade mineralized bodies and an extensive gold-footprint provided by BOT drilling, all in the first year of systematic, yet regional scale drill testing is impressive. Planning is now underway for a significant winter drill program commencing late 2017 or early 2018 dependent on winter conditions." A plan view of the drill results is provided in Figures 1 and 2. Tables 1, 2 and 3 include all relevant collar and assay information. The true thickness of mineralized intervals at Palokas is interpreted to be approximately 90% of the sampled thickness. The true thickness of the mineralized intervals at Raja and South Rajapalot, will require additional drilling to determine due to the complicated structural controls. Results from most drill holes have now been received (Tables 2 and 3). Thin mineralization was intersected in the remaining holes. Of note, outside the Kairamaat 2-3 permit and 2 kilometres east of Palokas, drill hole PAL0050 intersected 1 metre @ 323 g/t silver from 24.7 metres. Silver has not been identified in the system earlier and its context is under review. 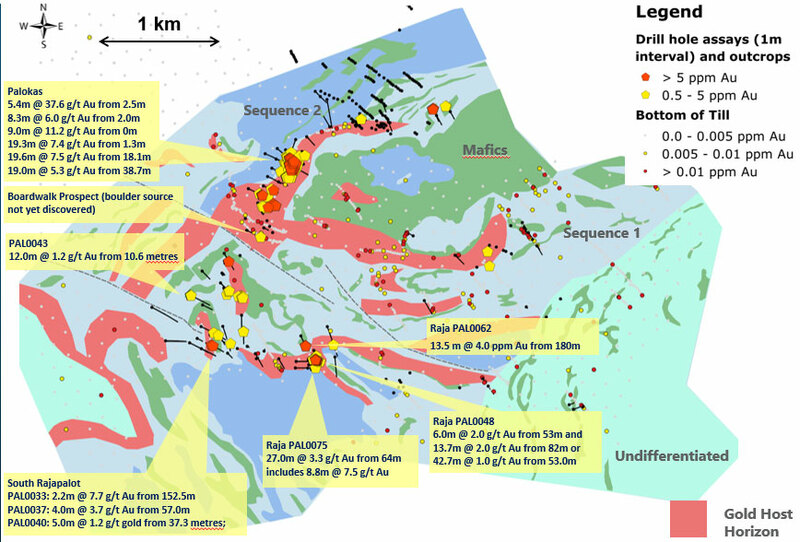 A broad area of 4 by 6 kilometres was drill tested by the 1,801 base-of-till ("BOT") drill hole program. The program was successful in defining known mineralization and also defined multiple new drill targets over an extensive area. The Rajapalot gold mineralizing system now covers more than 4.5 sq km based on diamond drill results, and is most likely to extend much further based on anomalous gold values in the BOT data. To aid in understanding and targeting, the next steps for the project are to build a comprehensive three dimensional structural and stratigraphic model from drill results, rock geochemistry and geophysics. Dr. Laurent Ailleres of PGN Geoscience, an expert in the building of 3D structural-geophysical models, and Dr. Nick Oliver of Holcombe Coughlin Oliver Valenta Global, a renowned Proterozoic structural and hydrothermal specialist are now involved with Mawson to create a full 3D model across a 4 x 4 kilometre area to aid in targeting in the 2017-18 winter drill season. A significant drilling program will resume at Rajapalot in late 2017/early 2018 when winter conditions allow access. Drilling has confirmed the presence of a large, gold-bearing, sulphide-bearing hydrothermal system associated with granitoid intrusions dated at 1.8 billion years, making the project similar in age to the Agnico Eagle’s 7.8Moz Kittila project that lies 150km north of Rompas-Rajapalot. Gold mineralization is controlled by a combination of granitoids and structurally-controlled fluid flow systems interacting with stratabound iron-rich rocks (Palokas-type). A new style of mineralization has also been discovered in the Rumajarvi area in where sulfides and gold occur in brecciated and fractured schists. Given the wide variety of controls on gold, the drill success rate remains exceptional. The source of gold mineralization uncovered in boulders at the "Boardwalk" prospect has not been yet discovered by drilling. 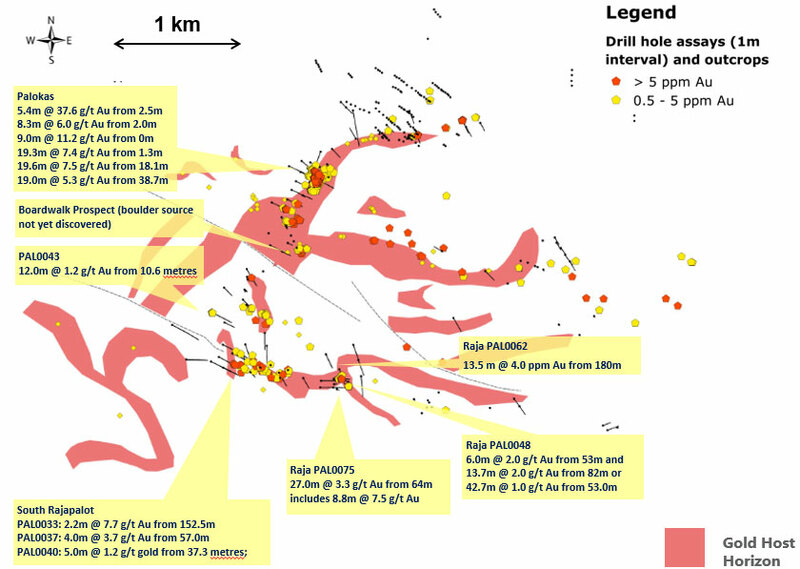 However, zones up to 20 metres thick zones of anomalous gold in iron formations has been intersected and are reported here for the first time (best intersection of 1 metre @ 3.19 g/t gold from 32 metres in PAL0074). These rocks further validate the "Homestake" geological model. A full technical and geological overview of the program can be viewed HERE. Two diamond drill rigs (K1 & K2) from the Arctic Drilling Company OY (ADC) with water recirculation and drill cuttings collection systems were used for the drill results reported here. Core diameter is NQ2 (50.6 mm) diameter core. Core recoveries were excellent and average close to 100% in fresh rock. After photographing and logging in Mawson’s Rovaniemi facilities, core intervals averaging 1 metre for mineralized samples and 2 m for barren samples were cut in half at the Geological Survey of Finland (GTK) core facilities in Rovaniemi, Finland. The remaining half core is retained for verification and reference purposes. Analytical samples were transported by Mawson personnel or commercial transport from site to the CRS Minlab Oy facility in Kempele, Finland. Samples were prepared at Kempele and analyzed for gold at Raahe using the PAL1000 technique which involves grinding the sample in steel pots with abrasive media in the presence of cyanide, followed by measuring the gold in solution with flame AAS equipment. The QA/QC program of Mawson consists of the systematic insertion of certified standards of known gold content, duplicate samples by quartering the core, and blanks the within interpreted mineralized rock. Interlaboratory comparisons are also conducted by Mawson, using fire assay techniques. In addition, CRS inserts blanks and standards into the analytical process. *0.5g/t Au over 2m lower cut in PAL0043.The true thickness of mineralized intervals at Palokas is interpreted to be approximately 90% of the sampled thickness. Owing to the complex three dimensional structural controls and brecciation, combined with the stratabound nature of the albitic host rock at Raja and South Rajapalot, the true thickness of the mineralized intervals is, at this stage, unknown.